Dramatic License opens their new season with “A Valentine Cabaret” in February. Performing songs about finding and losing love, the show will once again feature local favorites performing songs from Broadway and beyond. Look for it February 10-12. The regular season starts in March with the Tennessee Williams’ drama, “The Glass Menagerie.” Set in 1930’s St. Louis, this classic deals with the stern Amanda Wingfield who tries to protect her physically-challenged daughter from the outside world until the infamous “Gentleman Caller” upsets both of their lives. It runs March 1-18. Dramatic License will then present their first musical, the delightful two-person musical version of “The Fourposter,” “I Do! I Do!” This Tom Jones/Harvey Schmidt classic features the lives- from marriage to old age- of Michael and Agnes and gives us the haunting and beautiful song, “My Cup Runneth Over With Love.” This one runs from April 26 to May 13. The 2000 Pulitzer Prize winning “Dinner With Friends” arrives for a September 13-30 run. Featuring two couples shows us true friendship, marriage and the effect of infidelity both. “Moonlight and Magnolias” brings a side-splitting comedy to the boards based on the attempt to bring “Gone With The Wind” to the silver screen. David O. Selznick, director Victor Fleming and writer Ben Hecht close themselves in for a much needed re-write which leads to hilarious results. Watch for the high jinks coming to Dramatic License October 25- November 11. Finally, the popular Holiday Cabaret returns for a December 7-9 run. Looks like another exciting and challenging season for Dramatic License Productions. Contact them at 636-220-7012 or dramaticlicenseproductions.org for season tickets or more information. 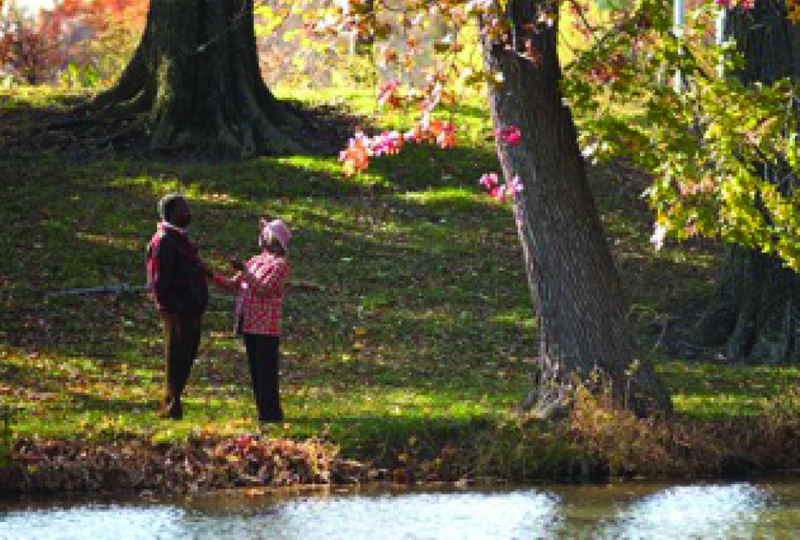 Ron Himes and Linda Kennedy star in the Black Rep's opening production of "On Golden Pond." Kennedy star in the show which will run through February 5. Shakespeare’s “A Midsummer Night’s Dream” follows running February 15 to March 4. Join them for this delightful comedy where we but slumber while these sprites cavort in Shakespeare’s classic tale. “No Child” runs March 14 to April 1 and then the blues reign supreme as we’re treated to a musical tragedy, “Ma Rainey’s Black Bottom.” It runs April 11 through NMay 13. The Black Rep then closes their season with the shocker, “Insidious,” which runs May 23 to June 24. Contact them at 314-534-3810 or theblackrep.org for season tickets or more information. Don’t miss out on the new seasons for both Dramatic License and, celebrating season 35, the St. Louis Black Rep.